Italian Gothic Development followed that of France, but in many instances kept alive the tradition of earlier methods of construction, mainly wall-bearing, solid masonry, more conservative than innovative. We shall delve into two diametrically opposed buildings, appearance-wise, yet each with internal forms of some Gothic development. We were first introduced to Florence in SESSION SEVEN, with the words of the early 20th century French writer André Suarès. But we can add a bit more here. 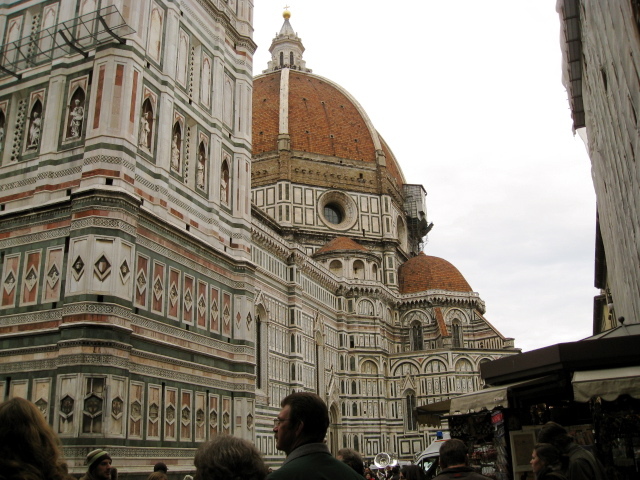 Situated in Tuscany, north of Rome, Florence had been the regional capital. 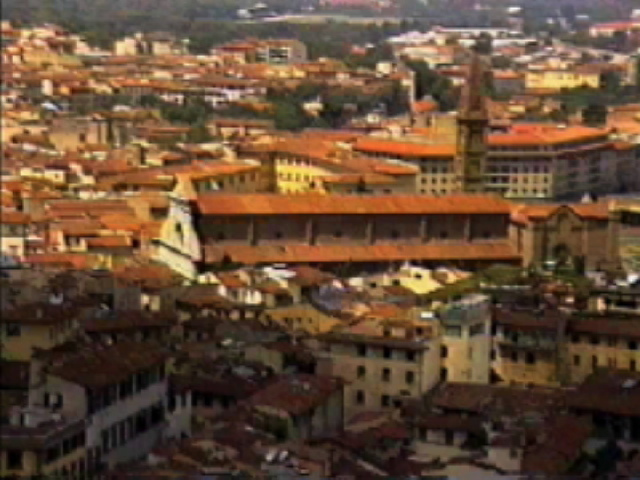 The city is situated on both sides of the Arno River, surrounded by the foothills of the Apennines, where Leonardo da Vinci was to “discover” atmospheric perspective, a technique he used in his landscape backdrops in almost all of his paintings. 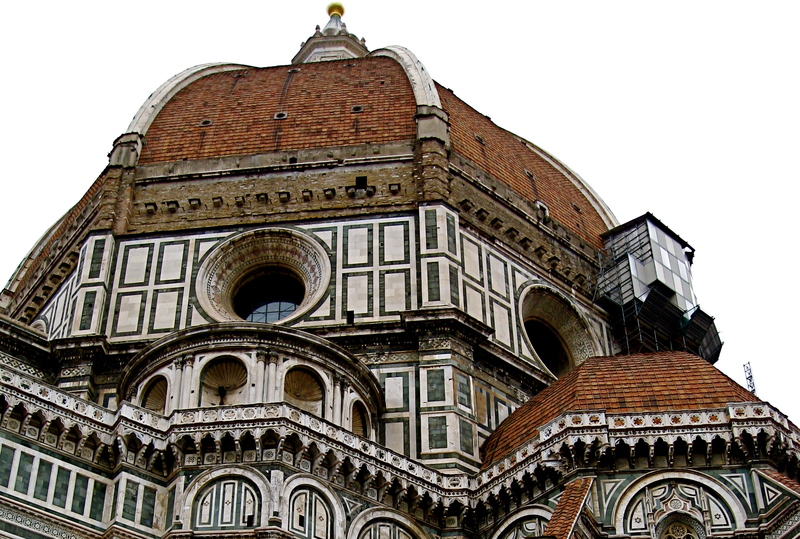 From the Middle Ages to the present time, Florence has been the intellectual center of Italy. 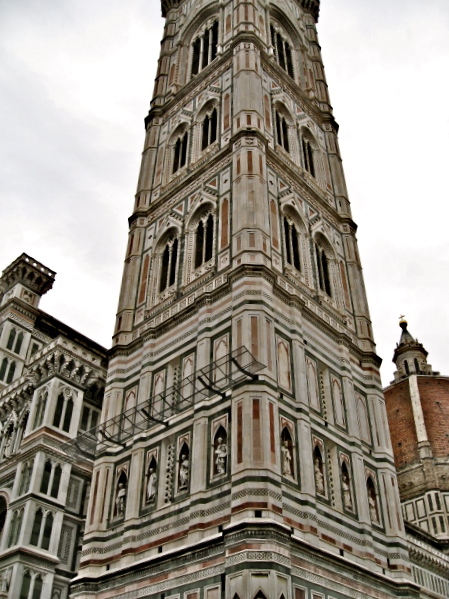 We will move directly into the Cathedral, followed by an overview, literally, from the top of the adjacent Campanile, the bell tower of the church. 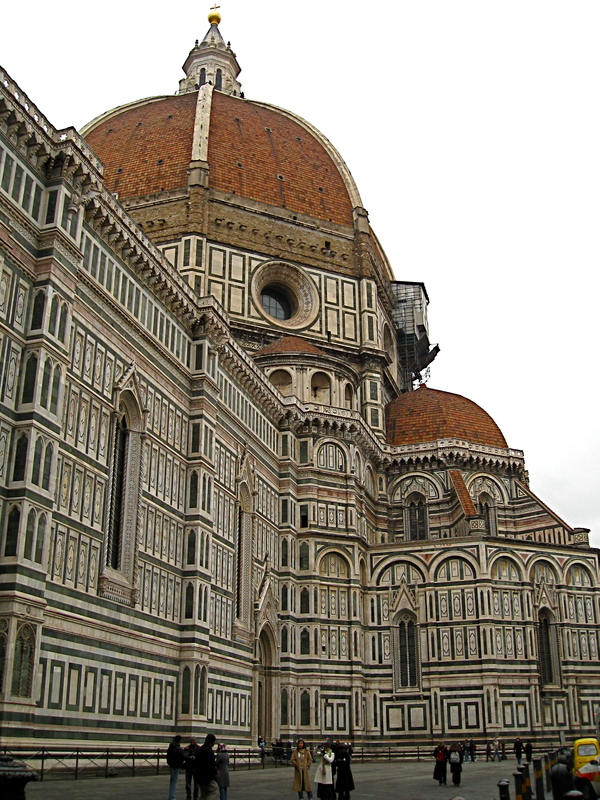 The Cathedral of Florence, officially Catedrale di Santa Maria del Fiore, and named for the lily, which is the emblem of Florence. We are approaching from the rear, the southeast. 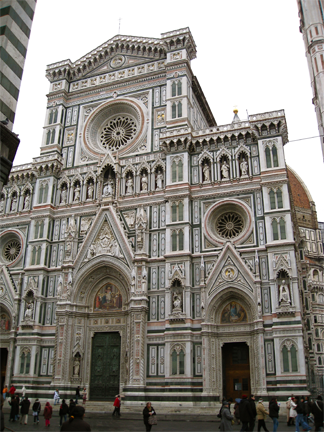 The design is basically Florentine Gothic in style and construction. Begun by Arnolfo Cambio (1232-1301) in 1296, work stopped when Cambio died, and was continued in 1334 by Giotto di Bondone (1266-1337), with Andrea Pisano and Francesco Talenti continuing after Giotto's death. The church was consecrated in 1436. The exterior walls are covered in colored marble, and show the way in which Italian Gothic differed from French and German development. Here in Italy the horizontal usually predominated, buttresses did not fly, and there were few pinnacles (except in Milan). 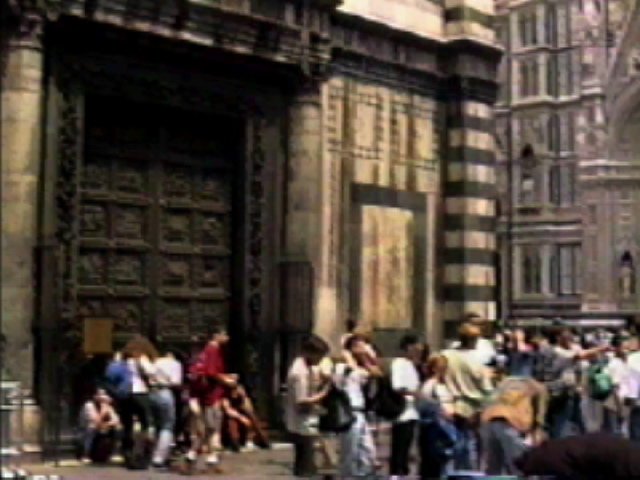 Apparently flying buttresses and other Gothic features reminded the Florentines of German architecture in particular, and of the Holy Roman Empire operating out of Aachen, which had its political eye on Italy. Consequently, the walls, with out buttressing, had to bear basic loads and were resultantly heavy. Windows were few and small (it was not possible to cut large holes in bearing walls), and so there's not much light inside many Italian churches, especially here in Florence. As we head westwards, we pass the Campanile, which we'll ascend in a moment. First, a glance about - you should recognize the building to the west, across the street in front of the Cathedral. That octagonal structure is the Baptistry of San Giovanni (St. John), an 11th and 12th century work, which we discussed in SESSION SIX. You can see how horizontals dominate, with semi-circular arches (a Renaissance characteristic taken from the Romans) quite prevalent everywhere. Standing at the base of the Campanile, we can examine the exquisitely carved marble panels. Notice the inlaid patterns. 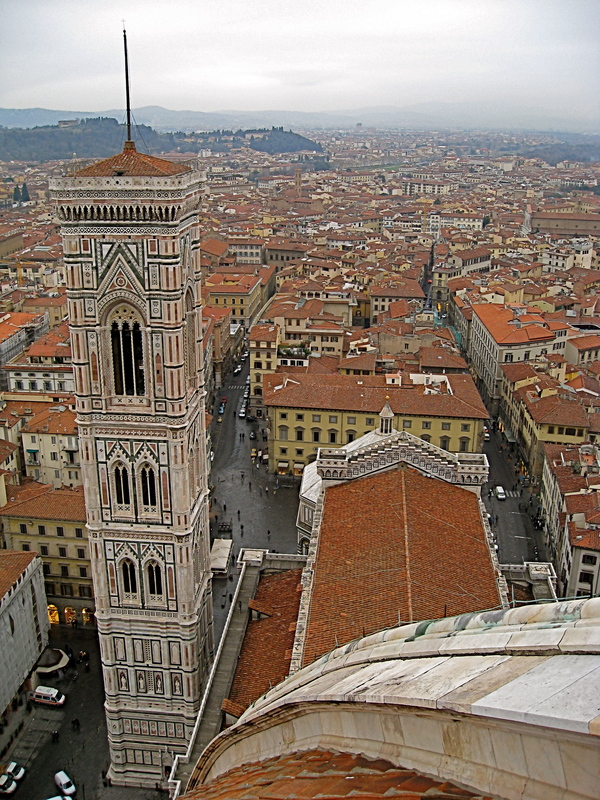 This is a view of the Campanile as seen from the base of the cupola, which sits atop the dome of the Caethdral. 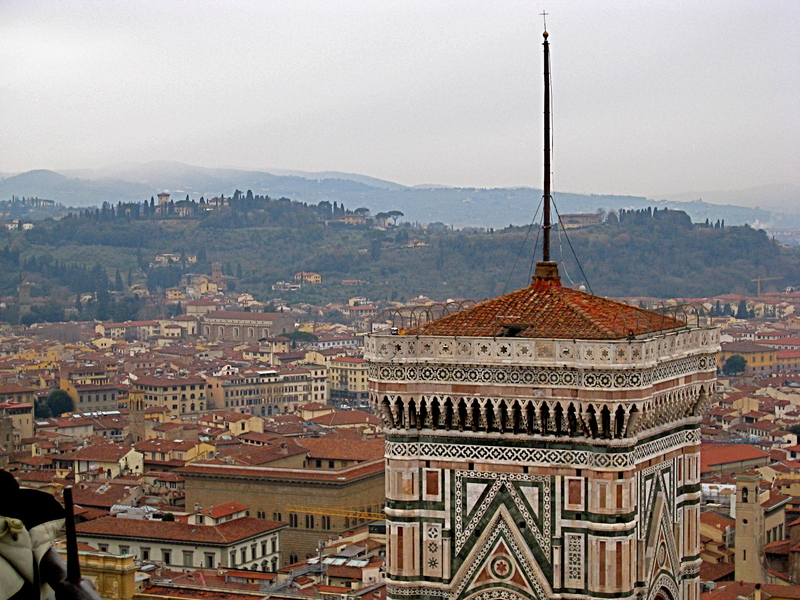 A view of the crowning element of the Campanile, and below are some views from that crest. A view towards Santa Maria Novella (in the center of the illustration), begun in the 13th century in a Romanesque-Gothic manner, but completed by Leone Battista Alberti between 1456 and 1470. The upper facade features what became known as "Alberti scrolls," which unified the wider side aisles with the narrower roof of the nave. Sometimes it takes a climb such as this one to realize certain things, such as: while most European church facades are on the west side of those buildings, as discussed in SESSION EIGHT, here we can see the sunlit facade of the church as it faces south. Having visited the church at ground level, of course, without any specific frame of reference, that orientation had never quite revealed itself. Perched here high above the city, in a bell tower adjacent to the Cathedral, and the face of which is on a direct line with the western facade of that Cathedral, it becomes obvious that Santa Maria Novella is at right angles to this complex, and obviously facing south. The building, as it appears, is considered to be in the style of the Renaissance, and will be discussed in the following semester. It's good to see that more and more cities are reclaiming their streets and public use of those streets immediately increases, be it for just sitting, strolling, or dining and drinking. 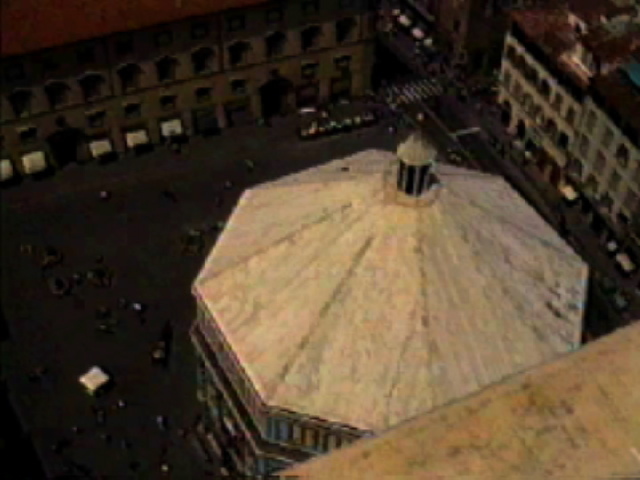 A bird's eye view of the Baptistry. The Piazza della Repubblica. Built between 1890 and 1917, after the demolition of the medieval Florentine town center. This square is at about the same location as the Roman fortress once was. Florence's most central square is a center of outdoor activity: from open-air cafes to street performers to fashion and bookshops, and even a children's carousel. This proves the theory: build an open space, fill it with attractions, and people will come. 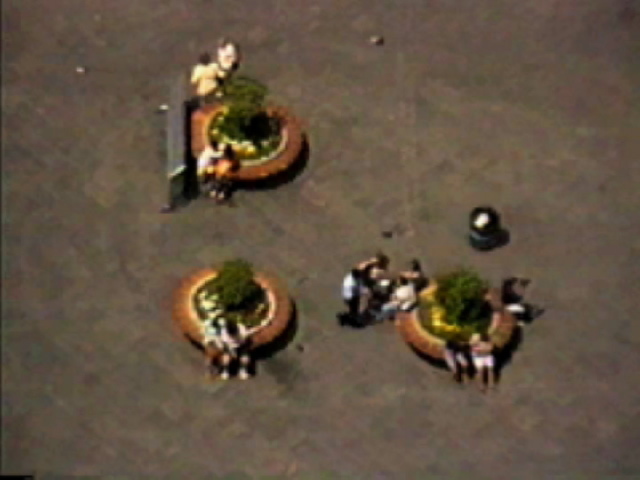 This square offers entertainment and a place to relax, key ingredients to a successful outdoor plaza. 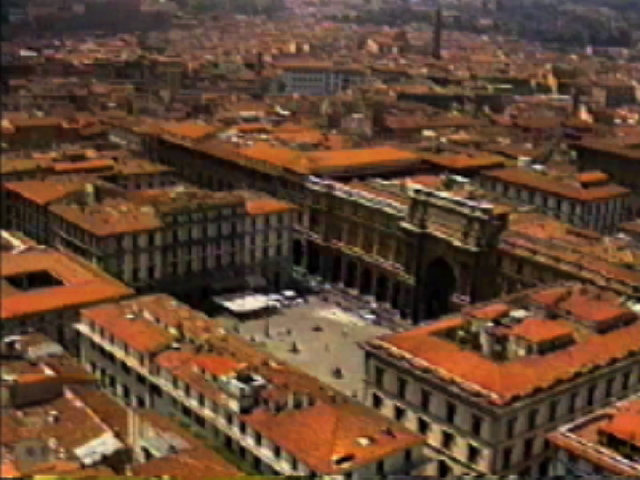 The square was created by destroying one of Florence's oldest Medieval neighborhoods, the "Mercato Vecchio." The monumental arch on the western side of the square was built to commemorate then King of Italy, Victor Emmanuel, in 1895. Many of my thoughts on urban development come from familiarization with the works of William H. Whyte (1917-1999) whose investigations are considered the epitome in the study of human behavior in urban settings. A most notable research project was his documentary: The Social Life of Small Urban Spaces (1980). 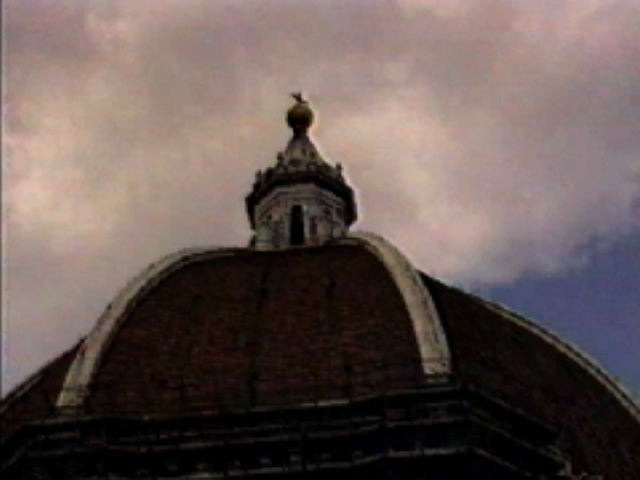 The dome, famous for being the first of its kind, construction-wise, is by Filippo Brunnelschi (1377-1446), who died before the cupola could be constructed. Although considered the first Renaissance dome, we cannot really detach it or our thinking from the Cathedral itself, so a bit of discussion and orientation seems appropriate. In fact, the dome is a direct offshoot of Gothic structural development, rarely if ever mentioned, but never the less a fact. 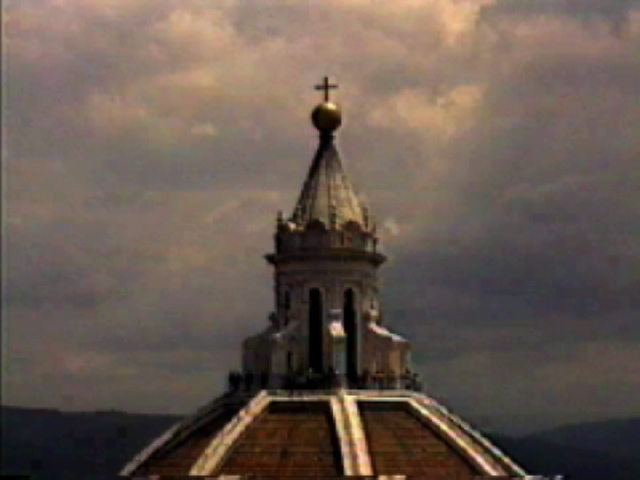 The dome is the centerpiece of the Cathedral. Designed and constructed between 1420 and 1436, it was the first dome to be built without scaffolding. 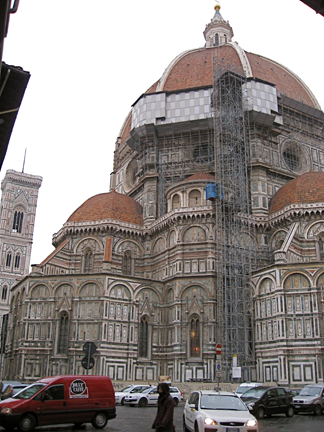 Brunelleschi designed (for the first time) a thick inner dome of interlocking bricks, which in turn supported an outer covering. The ribs are Gothic in character and seemingly support the brick paneling between them, as well as providing for continuity between the two shells. The dome, however, is characterized as the first Renaissance dome, in that it did not require buttressing, flying or otherwise, and employs the first known tension principles of hoops of timber connected by iron straps, binding or cinching in the dome, redirecting outward thrusts. The Byzantines had used iron tie bars to hold slender arches together, but this was the first such use in a dome. The diameter is between 42 m.(138') and 45m. (149'), depending on which source you read, and between 90.5m. (297') and 98.5m. (323') high. The lantern peaks at 113.4m. (372') above the floor of the nave. Followed in principle by Michelangelo in his design for the dome of St. Peter's in Rome, this dome begins a trilogy of Renaissance domes ending with St. Paul's in London, by Christopher Wren. 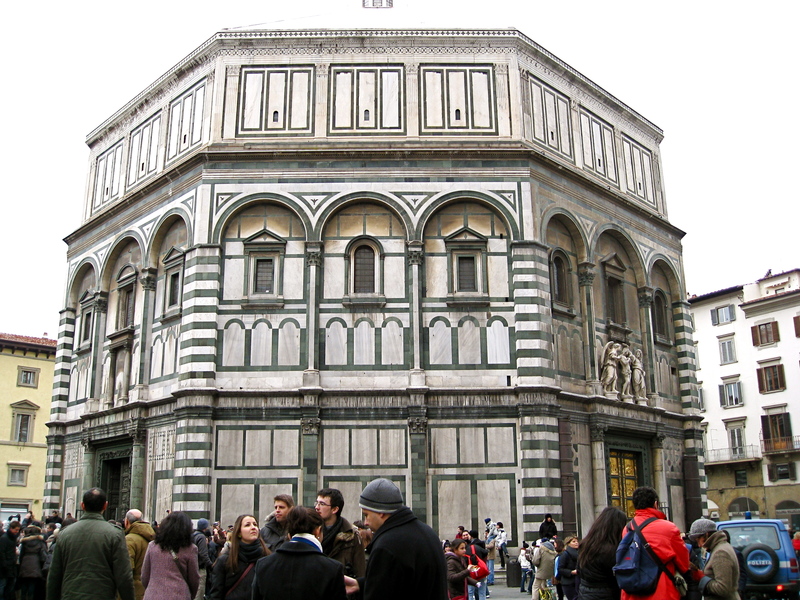 Legend has it that Brunelleschi (originally a sculptor) was so upset at losing the competition for the Northern doors of the Cathedral's Baptistry, that he gave up sculpting, turning instead to Rome, and its lessons of architecture. Ironically, he won the competition for the dome, creating the most extraordinary work of architecture in one thousand years - not since the days of Rome or Constantinople had such a space been created. 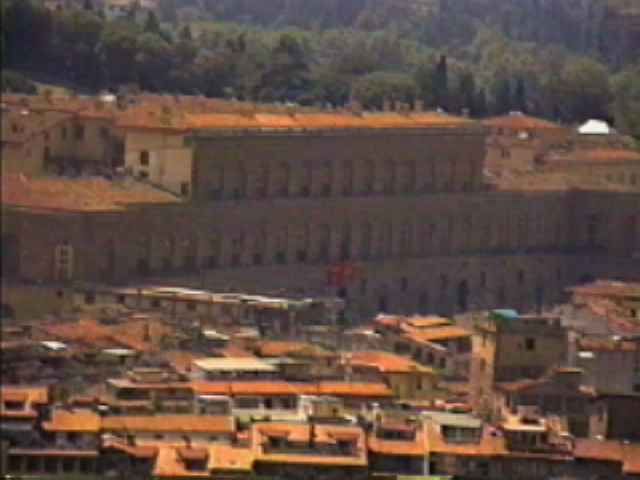 A glimpse of the Palazzo Pitti by Brunelleschi, across the Arno River, and bordering the Boboli Gardens. 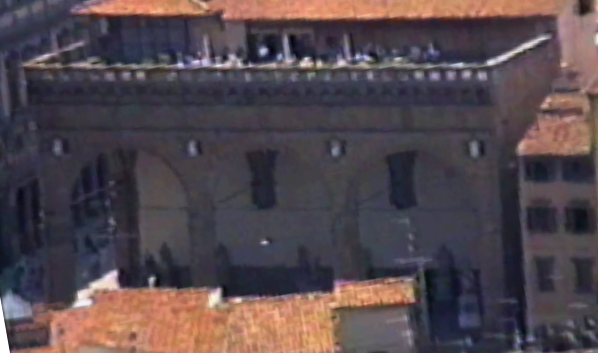 When the Medici's left the Palazzo Vecchio, this is where they moved. This is pure Renaissance, and features the strong horizontals developed in Italian design. The Loggia dei Lanzi can be seen in the distance, forming part of the Piazza della Signoria in front of the Palazzo Vecchio. The South Doors of the Baptistry by Andrea da Pontedera, known as the Pisan (or "Pisano"), 1330-36; its 28 panels tell the story of John. 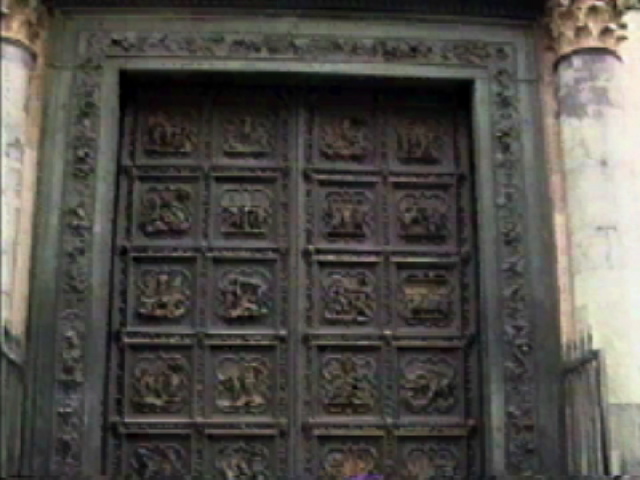 The door posts were designed later by Vittorio Ghiberti, son of Lorenzo, in 1462. 1. Windows around the sides of the Cathedral are very tall and slender, crossing over more than two horizontal bandings of the facade, thus creating more of a vertical feeling, consistent with the Gothic. Contrast this to the Western facade, in which similar windows are contained within only one such horizontal level. 2. The "tabernacles," or spired projecting niches at the peak of doorways, project up over horizontal decorative bands. On the West facade, these tabernacles are imitated on the peaks of the main door jambs, but do not rise above their background horizontals; they are contained within those lines. This begins to sort out the Gothic vertical from Italian Romanesque and later Classical designs, in which the horizontal runs without interruption. 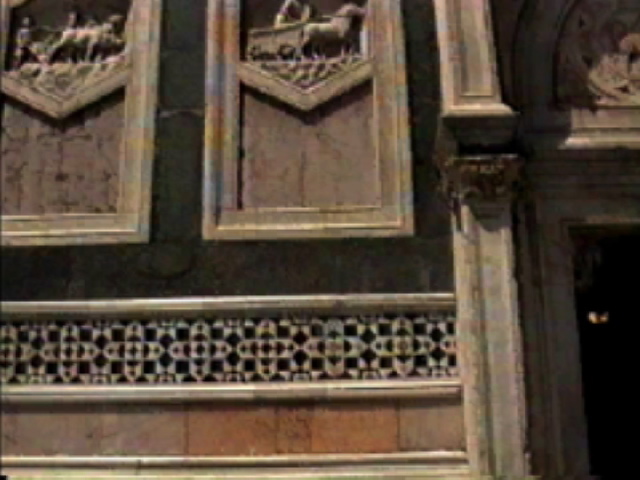 The point being that earlier designs of the facade, particularly by Arnolfo di Cambio, appear to have been followed to some degree, but were not exactly identical. 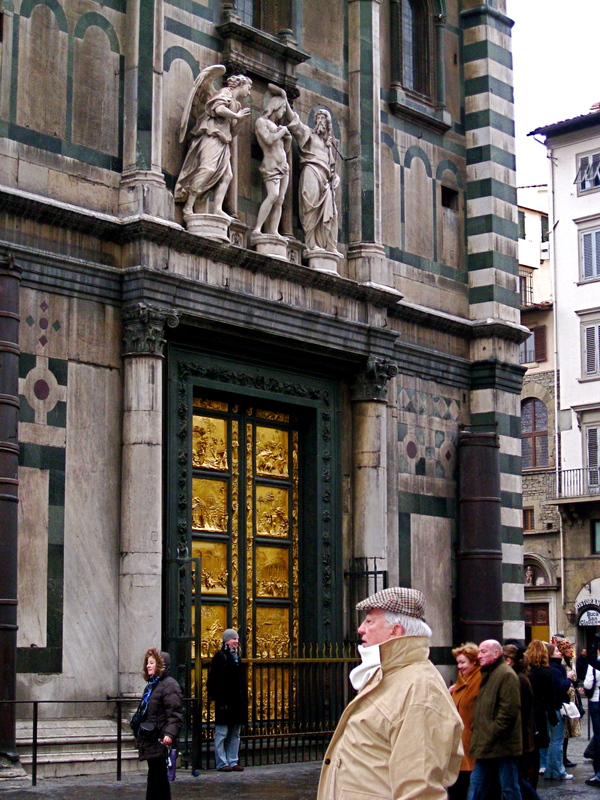 The North Doors of the Baptistry, resulting from a competition held in 1401, mark a long-acknowledged beginning of the Renaissance. This seems to have been the first time that a competition was held to determine the creator of a specific work of art, as opposed to having patrons select their own artist. Thus the expression "man is the measure of all things" took on new meaning, as individualism took form. Interestingly, one of the 48 busts featured on the borders of the 28 panels, is a self-portrait of Ghiberti. This so definitively illustrates the new self-revelation of the artist as an individual! The doors illustrate passages from the New Testament, with the lower eight depicting Evangelists. The door jambs are also by Ghiberti. Technically the door panels represent advances in casting - the undercutting is extensive, the scenes often intricate and complicated. The spirit of the panels seems to be lyrically harmonious, and a classical kind of tranquility permeates the panels. There is also obvious and correct attention to nature, anatomy, and perspective, all to become characteristics of the new age, the Renaissance. 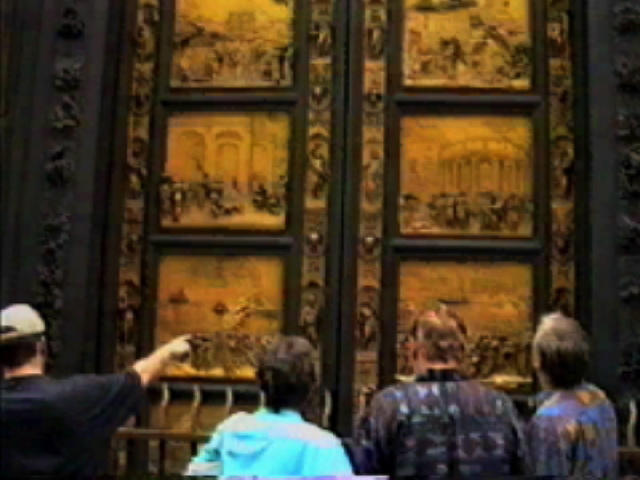 This time Ghiberti was handed the commission, so successful was his first set of doors. Instead of the 28 panels on both the South (Pisano) and North (Ghiberti) entrances, Ghiberti chose to create 10 large square panels, depicting scenes from the Old Testament. Continuing the humanistic expressions presented in his North Doors, Ghiberti went so far as to depict 100 figures in more than one scene. Gone are the quatrefoils framing the South and North - here we have full-bodied presentations, with very evident perspectives.